Zero Energy Two is a major step forward in sustainable housing. This revolutionary design features zero net energy use, extremely low ‘near zero’ embodied energy and extremely low cost. This design is the result of years of research in energy efficiency and low cost, alternative building methods. 1,275 sq. 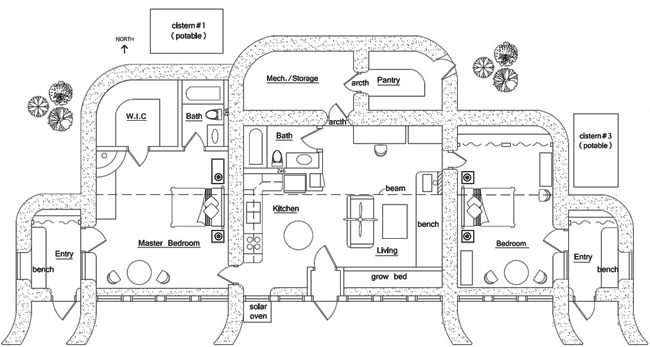 ft. interior, 2 bedroom, 2 bath; footprint: 36′ x 73′ not including cisterns. Are the plans for a sand bag house, or just any general material? Also, if it is a bag home, do the plans include the count for approximately home many bag are required. Can the north side of this home be buried, do any modifications need to be made if earthing-in this home? We are wanting to build an earthed-in solar pit style home in Southern Missouri, with sandbags for the walls. This plan looks about perfect just needed a few additional details, Thank You. “Take-offs” or lists of materials are not included. 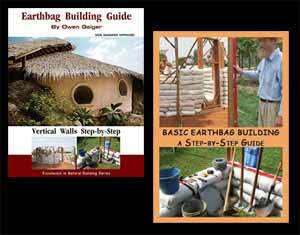 Earthbag walls can be earth-sheltered if properly built. This typically includes using 24″ wide bags plus some type of reinforcement — posts and beams, rebar, etc. plus proper moisture protection and drainage. Hi Owen is been a long time I want to build this house since I have the plans in my land in Honduras, Central America the question is related can I build with local materials brick, rock and adove. Also What would it cost to have an engineer plan for this house if you can find a way to do it. Electricity is not primary energy I will use wind power and to store energy and solar panels and we will low usage of energy in the home just for lights no many other electronics except maybe a stereo systems. A TV used only occasionally to see videos only not regular TV. I hope to hear from you soon. thanks. I bought the plans from you. Yes, the thick walls on my house plans can be used with many different materials, including stone, adobe, etc. Find a civil engineer in your area who can give you an estimate. Hopefully you can find one who works with natural building. Is it possible to flip this drawing. I want the master bedroom on the other side. I am looking to build, am not a professional or builder. I see they do not come with electrical or plumbing specs, but there is a place for mechanical storage, is this for water filtration and pumps for the cisterns? and solar batteries, etc..? We don’t have codes where I live I just have to pay a flat fee to build. There’s no charge to flip (mirror) the plans. Just specify this when you order. The mechanical room is for water heaters, filters, radiant heat, etc. I like your plans as they are very similar to the designs I have been playing with. Specifically I like the short distances for water etc. I’m in New Zealand and we have some major bureaucratic hoops to jump through. The Government can be made responsible for buildings that fail. Thus are a little conservative. Can you advise on testing engineering etc for these houses. Specifically zero energy 2. Also I will need detailed plans of foundations and tie in etc. I’m happy to pay for the designs but will I still need to engage a draughtsman to draw up all the details also? You need to hire a licensed engineer to get code approval and do the detail drawings. There are two engineers in the US doing this now. You’ll have to search for one in NZ.